When is emergency & exit lighting required to be installed in a building? On several occasions, I have been asked about the requirement for the installation of emergency lights in small (Class 6) retail buildings. When I say small I mean less than 500m2. The Building Code of Australia (BCA) 2010 provides the deemed-to-satisfy requirements for the installation of Emergency Lighting and Exit Signs in Section E, Part E4. Essentially for all Class 6 buildings over 100m2 require emergency lights; and all Class 6 buildings require at least one exit sign. 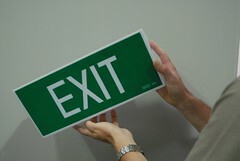 All required emergency lights and exit signs should must comply with Australian Standard AS 2293.1.